Kevin Hart cultivates a brand of relentless positivity. The comedian and actor makes motivational Snapchats from the gym at 5:30AM, trumpets his Laugh Out Loud streaming network as a place for upcoming, multicultural performers and repeats the mantra "live, love, laugh" without any irony. Like Dwayne "The Rock" Johnson, he's created a tirelessly optimistic public image that cuts across race, class and mediums, and it's taken Hart straight to the Forbes list of highest paid comedians. His new mobile game, Gold Ambush with Kevin Hart, looks like another piece of that upbeat empire. 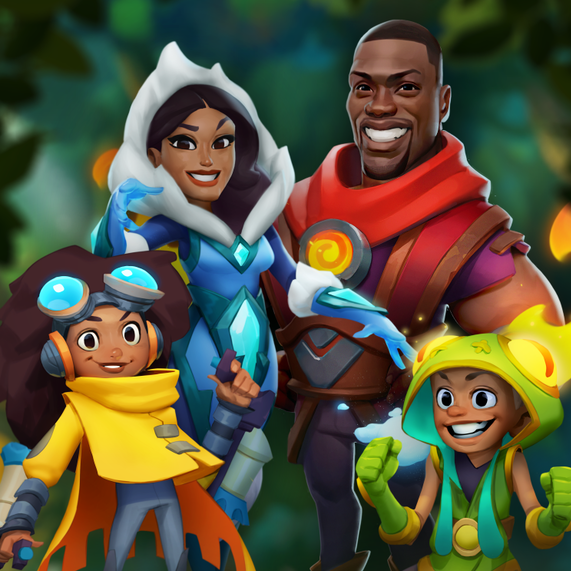 Featuring Hart, his wife Eniko, as well as children Heaven and Hendrix as playable characters, the game is a Temple-Run-meets-Clash-of-Clans combination in a medieval setting. It's light on violence and big on Hart's wide, cartoony grins. It should play right into his brand. But just days after issuing an emotional apology on Instagram to his wife and kids following rumors of infidelity -- as reported by TMZ -- the timing is poor. "I'm making the game fun but I'm also making it family-friendly without forcing that down people's faces," he told Engadget in an interview conducted before his public confession. "It's a game for everybody." The game was made by StandUp Digital, a self-described "celebrity mobile entertainment company" that Hart is a partner in, spun off from app developers Pinxter Digital. As a game, Gold Ambush is not groundbreaking. Its mechanics mirror the endless runner, world building and tower defense games which overcrowd app stores. Pinxter says there will be inside jokes from Hart's stand-up performances thrown in. But the key value-add is the mere presence of Hart, a man with 54.5 million Instagram fans, whose star is still rising. Asked what's different about this game, Hart responds: "What's unique about this one is that you'll be able to play with me and my family. You can pick me. That's how you win. Cheat code: Kevin Hart." Hart says he's been a gamer from the days of Super Mario Bros. on the NES as is a fan of the Madden NFL and NBA 2K series. His kids, meanwhile, are "big Minecrafters." Recently, he's been playing Mortal Kombat with his son. "He's big on the fighting games so he destroys me, but as a dad, you've got to sit there and just take it," Hart says. "Talks trash to me the whole time, doesn't teach me moves or nothing. But it's good, it's a good time." Has his knowledge of gaming helped with becoming a partner in a mobile entertainment company? "Not at all," Hart says. "This is a completely different world that I'm now getting educated on." Mobile gaming lines up with another aspect of Hart's brand. Aside from being a fountain of energy and optimism, Hart portrays himself is as a business mogul who started stand-up comedy at 18 and is now building an entertainment empire. He's far from the first celebrity to slap their name on a smartphone game, and even dabbled in a Doodle Jump-style app in 2011. But it wasn't until last year that mobile gaming overtook PC and console gaming for the first time with revenues set to reach $46.1 billion -- 42% of the gaming market -- in 2017, according to Newzoo. When our conversation turns to the amounts of cash in the sector right now, with games like Mobile Strike with Arnold Schwarzenegger delivering massive revenues, Hart lights up. "It's a lot of money. This is why I'm over here in the gaming world" he says, chuckling. "Welcome Kevin Hart. This is why I'm here. I want some of that. I want to do what they did."